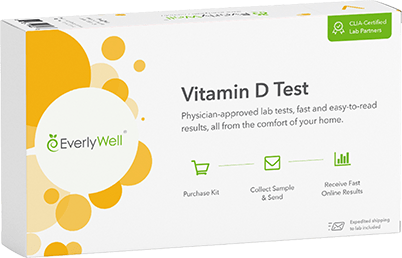 This at-home test can alert you to a Vitamin D deficiency, which can contribute to an overall state of inflammation in your body. Inflammation is an immune response to trauma or infection. The body responds with pain, swelling, and redness, which are all part of the initial inflammatory response. 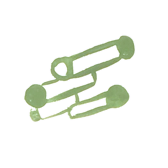 Short-term inflammation is referred to as acute inflammation and is usually self limiting. When inflammation persists, or is in response to the body’s own tissues, it is referred to as chronic inflammation, which can persist indefinitely. 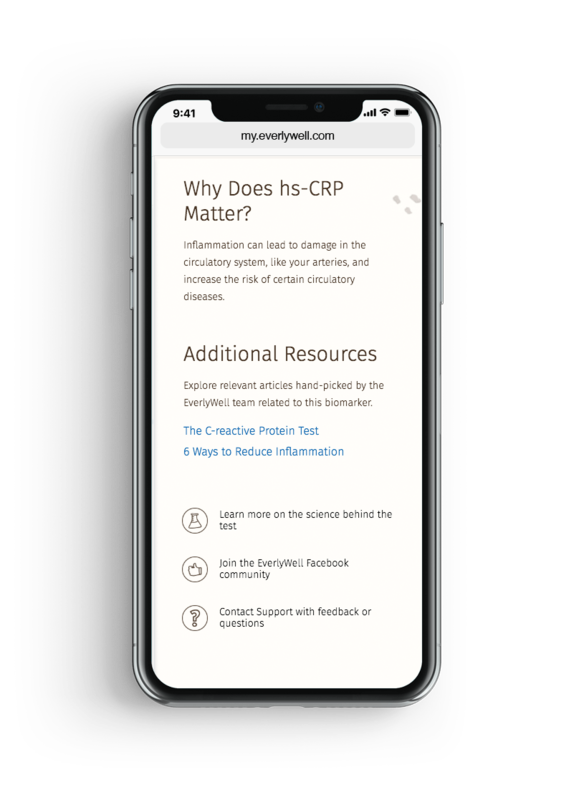 C-Reactive Protein, or CRP, is a protein that increases in the blood with inflammation. 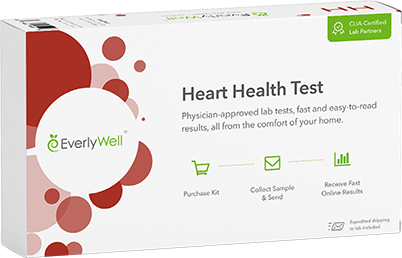 The high-sensitivity CRP test (hs-CRP) can detect even small elevations of CRP protein as an indicator of low levels of inflammation in the body. EverlyWell has included a Vitamin D screen as part of this panel. 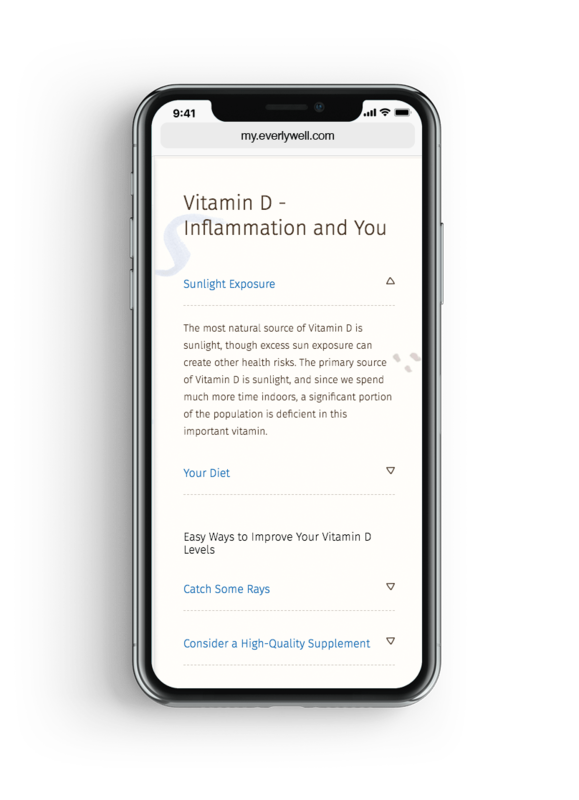 Though Vitamin D is a valuable marker on its own, there is evidence that low vitamin D levels may correlate with increased CRP levels. You might consider this test if you are experiencing any of the symptoms listed below or are concerned about your CRP and/or vitamin D levels. 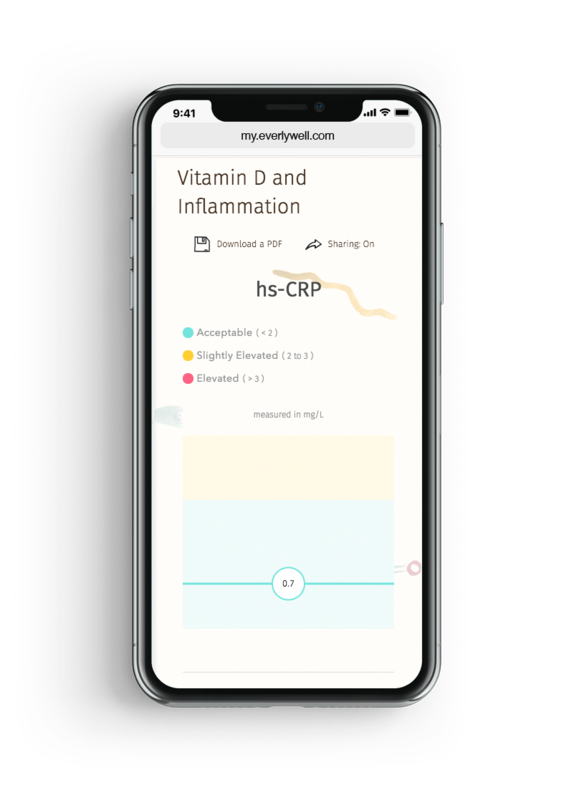 Your results will contain your personal levels of CRP and vitamin D and whether they are low, normal, or high compared to the appropriate reference ranges. 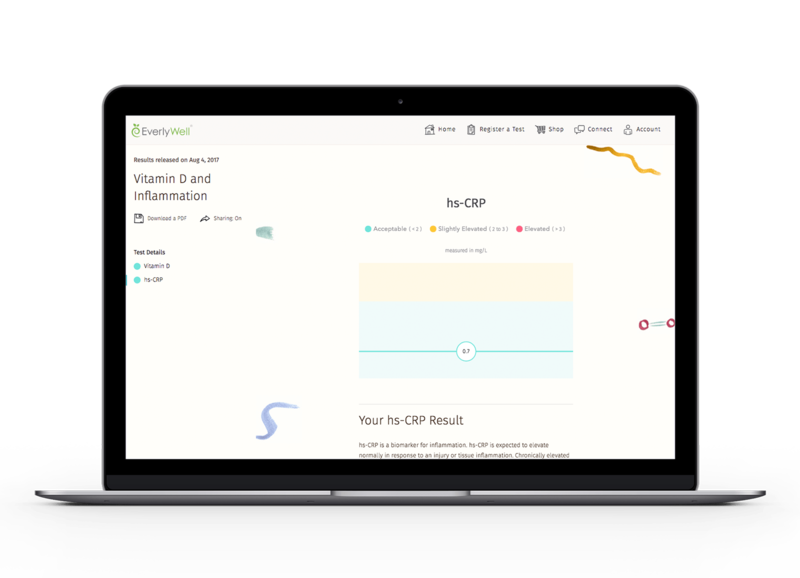 It is important to understand that a single C-reactive protein (CRP) level is not always indicative of your baseline level of inflammation. 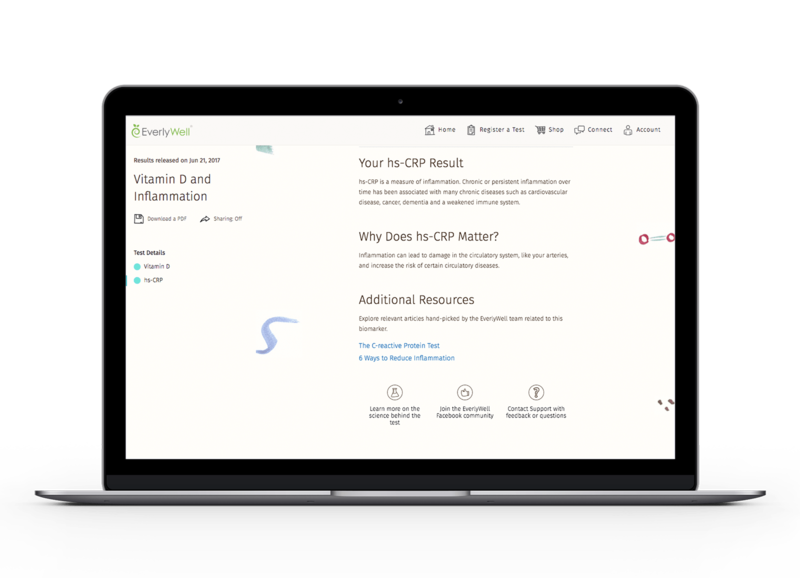 CRP can be elevated by normal changes in your body, such as a recent illness, infection, or trauma. An elevated CRP level should be confirmed with additional testing to determine if chronic inflammation is present. EverlyWell can suggest dietary and lifestyle changes that can help you regulate vitamin D levels in your body. 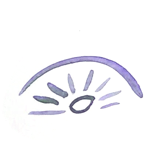 If your vitamin D levels are low, you may wish to modify your diet and sunlight exposure to maximize vitamin D levels in your body. If you exhibit elevated CRP levels, you may consider waiting a month or so and retesting, as the elevation might be the result of recent illness, infection, or trauma. Sharing your EverlyWell results with your doctor is the best way to create informed decisions about your health and wellness planning.